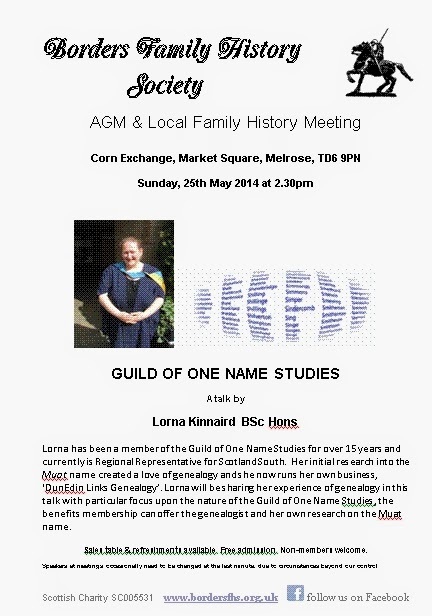 Borders Family History Society: Why Do We Need the Guild of One Name Studies ? Why Do We Need the Guild of One Name Studies ? Our Annual General Meeting is this Sunday, 25th May, at 2.30pm in the Corn Exchange & Ormiston Institute, Market Square, Melrose, TD6 9PN, however, as is usual, we'll have a talk too. Map. We desperately need new members to help us run the Society by standing as specific officers and as members of Council. In particular, we have no nominations for Book-keeper, Treasurer or Editor. This Sunday's talk is by Lorna Kinnaird. Lorna has been a member of the Guild of One Name Studies for over 15 years and is the Regional Representative for Scotland South. A one-name study is a long project researching information about a surname and all the people who have held it, as opposed to a particular family tree (the ancestors of one person) or descendancy (the descendants of one person or couple). Her initial research into the Muat name created a love of genealogy and she now runs her own business, ‘DunEdin Links Genealogy’. She will be sharing her experience of genealogy in this talk with particular focus upon the nature of the Guild of One Name Studies, the benefits that membership of the Guild can offer the genealogist and her own research on the Muat name. I think you'll find this a very interesting talk whether you're interested in family history, or Muat, Mouat or other spellings. Come along and find out why we need the Guild of One Name Studies. It’s free to come in. We'll have a range of family history publications available to buy, and there’ll be light refreshments (donation expected) available after the talk. If you have a problem with your family history, please discuss it (no charge) with one of our volunteers. This is the last talk before the summer; the subsequent talk (the first one of the 2014/2015 syllabus) will be on 28th September.